Sorry, this is long but important, and worth reading through if you care about the survival of coral reefs. It is now becoming more and more clear to everyone except fossil fuel industry apologists that IPCC made a very serious mistake: they badly UNDERESTIMATED the long term impacts of climate change, the very opposite of what the highly paid oil/gas/coal funded deniers have been propagandizing. That paper was totally ignored at the time, but now the top climate change scientists and economists have independently come to exactly the same conclusion as I did 23 years ago. See the articles just published with the comments of the former World Bank Chief Economist, who is regarded as the authority on economic impacts of climate change (at bottom of this message). In other words there is not a snowball’s chance in hell that governments will act in time to save coral reefs from massive heat stroke mortality. Today I was in a meeting on tropical pasture restoration, and one participant told me that the top Geoengineering proponent at Harvard recently said “well if we lose coral reefs, so what?”. That is what we are up against! Governments have knowingly decided to sacrifice coral reefs so they can continue their carbon addiction, and they don’t think anyone will notice. How did we get to the point that the extinction of coral reefs by global warming is now inevitable? Because governments frittered away all the opportunities to do anything at all when there was still time to act. 23 years ago, when Ray Hayes and I showed the first data that coral reefs bleached at monthly temperatures only 1 degree C above the long term average in the warmest month, and could be predicted accurately from satellite HotSpot data, the handwriting was already on the wall unless governments reacted immediately. Governments refused to act to save coral reefs. In 1992 at the Earth Summit in Rio de Janeiro I briefed the small island developing states delegations and warned that if they did not stop global warming then and there they would lose most of their corals in the next 20 years. They were bought off by the rich countries into accepting a death sentence by suicide pact, a climate change treaty that would kill their coral reefs and drown their low islands. Why did they do so? In large part because they were bamboozled by the deniers paid by the fossil fuel apologists. In 1990 Ray Hayes and I convinced NOAA to hold a meeting to discuss the implications of high temperature bleaching, and to develop an action plan to deal with it, but when the meeting we had originated was held in Miami we were specifically disinvited, and Bob Buddemeier and Chris Delia, who were given the conference we had been responsible for, announced a “consensus” that there was no evidence that high temperature had anything to do with coral bleaching, and they got an article published in SCIENCE saying that claims that high temperature caused bleaching were made by irresponsible publicity seekers whose wild claims had been refuted by the scientific community! NOAA, AIMS, and GBRMPA then spent millions over the next 20 years first denying that high temperatures cause bleaching, then paying hired guns to find any other possible cause. When they failed completely to find other causes they had wasted two decades and succeeded in preventing action to the point that it was too late, so they invented the fiction of “resilient coral reefs” to say that there was no need to act anyway! In other words, the coral reef funding establishment, and those who took their money for bandwagon “science”, share a large part of the blame. Coral reefs will be the first ecosystem to be destroyed by global warming, but they won’t be the last! That is easily done with existing technologies, which will be covered in the book on innovative methods for soil fertility restoration, carbon sequestration, and reversing CO2 increase that I am now editing with Ron Larson and Joanna Campe, which will be published later this year. If we don’t tax carbon at a price that pays for the real costs of its removal, and simply play economic games with conventional market mechanisms to price carbon, we will get the absurd market failures that have made the European Carbon Market total nonsense and have resulted in INCREASED emissions rather than reductions. Instead of making pollution permits costly, they simply gave them away free to the biggest polluters, and they issued far more permits for CO2 emissions than the polluters were even capable of producing! The pathetic result is that the market price collapsed to levels so low that pollution is basically free, with no incentive to reduce it. 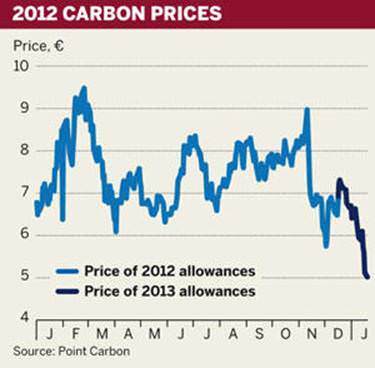 In the last few weeks, since the start of 2013, the price has further collapsed to record lows (see below, note these are in Euros per tonne of carbon). Consider that the cost of carbon capture and sequestration (CCS) by separating CO2 from fossil fuel emissions and pumping it underground where you pray that it never leaks out, is more than $200 per ton, and you will realize that nobody would waste time getting rid of their CO2 pollution when it costs 40 times more than the carbon credits they could gain for doing the right thing!